Last Month Chantell and I decided to have an overnight Challenge. 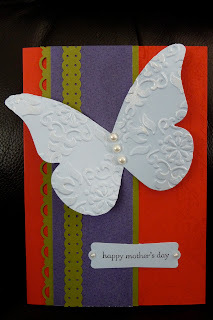 We used a card layout from page 55 of the 2011-2012 stampin' up catalogue to inspire us. Here is my card. I liked it so much I decided to give it to my mum for Mothers day. Chantell made this beautiful card using two step stamping.